When I gave birth last year here at home, there were already long held plans of what I was going to do with my placenta. I wanted to plant it, to honour it and give it the respect it deserved by planting a tree over it. My only slight problem, was that I didn’t have access to dirt, real in the ground dirt. My images of planting a tree, that would one day be metres and metres tall, providing shade and perhaps some sort of food that my grown up children could eat from, would have to be slightly deviated from. (We live in a rented apartment, with a small shared courtyard.) 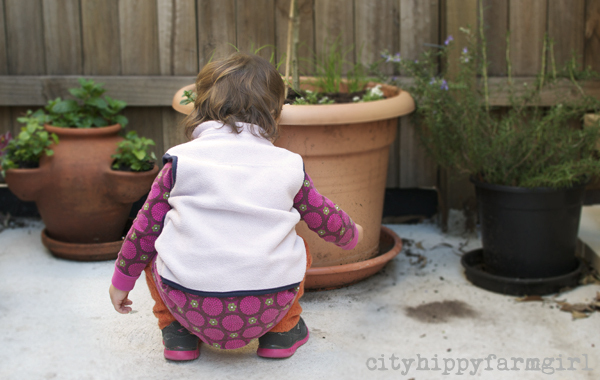 There were no substitute backyards to choose from for us and I wasn’t convinced some guerilla gardening placenta style in our local park would work with long term results. So with that in mind, we kept it frozen in an ice cream container until the right day came along. Finally the time felt right. A large pot was bought and filled, ready to take in the precious cargo. I still hadn’t quite decided on what plant was going to go in, but I was ready to make the first step in honouring our placenta. After some whispered personal words, and a few fascinated pokes, prods and careful watching from the little people. I covered it with soil. Loosely covering the top of the pot with another pot, so no neighbouring dogs would try to investigate. I could then let the placenta gently break down before having something planted over it. One month went by, and it had completely broken down. Every little part of it. You would never have known what was once there. Magic. Now I just had to decide what to go over the top? I narrowed it down to a citrus or an olive tree. Something that could handle being in a pot and wouldn’t mind the somewhat brief sunlight that my little courtyard could offer it. I talked with Nick from Milkwood to see what he suggested and a cumquat came up. I felt a bit mean initially, as I was the only who actually liked them. But I did like them, actually I loved them, and maybe one day this little girl would love them too. What sold me completely was standing before the ‘Australian Cumquat’ in the nursery and seeing the sign say, “hardy” and “well suited to pots”. I think this was our plant. 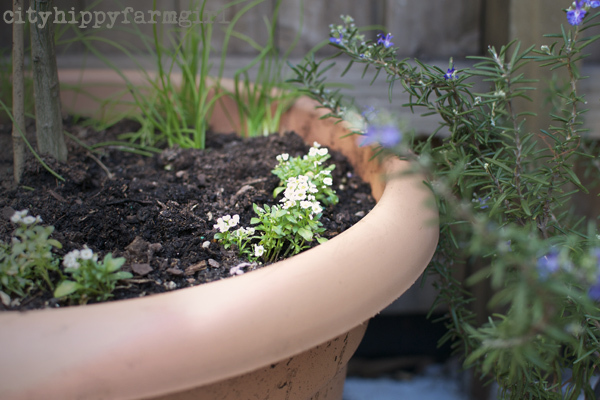 Chocolate Mint, chives, and alyssums for keeping moisture in, (instead of using mulch and being useful at the same time.) Plants chosen for being edible or encouraging of bees, hopefully not going to compete for too much root space and fragrant enough to deter pests. 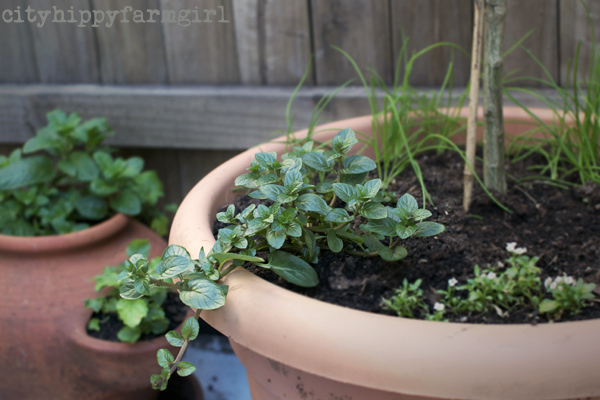 Two pots either side of this now also have regular mint and lemon balm. On the other side rosemary- which also flowers, encouraging bees and has a pest deterring fragrance. Above the cumquat on the fence line, more sweet scented alyssum. I’m hoping I’ve got it right and these plants will all be happy where they are. At the very least, I’ve now got a tiny once concrete corner that is already bringing joy. Just knowing that in our tiny backyard space, our plants are doing what that precious placenta first set out to do, bringing life. If you are thinking about planting your own tree of life, some sites that might be helpful. Tips for planting a placenta fruit tree. How about you? Are there any particular cultural customs that you observe? Have you planted a placenta? This entry was posted in Going Green, Rambles, Waffles and Digressions and tagged birth, cumquat, homebirth, natural, permaculture, placenta, placenta tree, pot, tree of life by cityhippyfarmgirl. Bookmark the permalink. I’ve never heard about doing this before. But I really like it. Thanks for sharing- and for putting up the links- interesting reading. My son was born in a hospital in southern Italy 40 years ago. I did see the placenta briefly before it was whisked away. wow placentas are amazing!!!! I didnt get to see mine as I had an emergency c section. Ive never seen one before thanks for posting these pics. I think its natural that to use something that is so nutrient rich to enrich another living thing. A placenta is designed to provide nutrients and to give life using it as fertilizer to a plant is an obvious way to do this. Comquats do really well in pots. 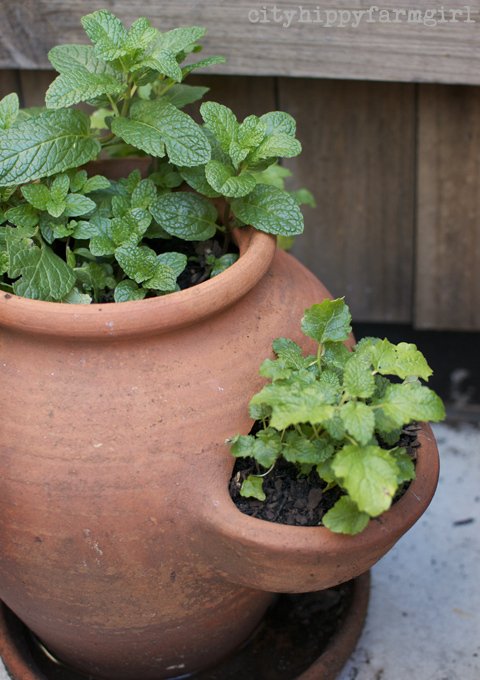 By the time you have your own garden you can transplant it to a bigger pot and it will looks fantastic on a patio or deck and give you lots of fruit. A really interesting post thanks for sharing! things have changed so much since i was a midwife and since i had my bairns..in my time placenta’s were always examined carefully following the birth and the size and other details were recorded..they were then indecorously put in a placenta muncher..i don’t remember anyone ever wanting to see their placenta or keep it..i didn’t see the three from the births of my children..but i was confined to bed with my three and given no opportunity to walk about either so there’s been a huge progression in midwifery practice..now birthing plans mean parents have a say about the how, where and even the when of the birth of their child which is a really good thing.. Things have changed a lot haven’t they Jane. Something’s for the better, and others, not so much. I had a good look at my first two placentas, but regrettably didn’t do anything with them. Love it! We have 2 in the freezer and another placenta arriving in November! We now have our very own garden and orchard and bare root tree stocks are arriving any week. There has been much discussion and excitement about which trees the kids would pick for their placentas. Apparently passionfruit absolutely adore it! Yay! Clare that’s awesome. I wonder what you will choose… My mum planted a passion fruit over my brothers placenta and it flourished for many years. Wishing you a beautiful upcoming birth. It seems to do the trick as far as feeding is concerned. Thank you Joanna. It really is giving back to the earth..just pot style. We too had a home birth and everything went to plan but we never did think about what to do with the placenta, and in some ways I am glad as with our move,t he placenta and its tree would likely have remained at the old house – which would have been hard. In saying that, I did seriously consider encapsulation which is another great way to return the placenta to the world (I’m not up to a chilli like some are – kudos to them I say) but when I mentioned it to hubby I was met with such a resounding YUK I wasn’t game to ask for the necessary $$$. Next time (and I hope there is a next time) I will definitely not be sending away our placenta as waste. Thanks for sharing your story. New Zealand has the best maternity care in the world Max. Pretty darn awesome country to live in. 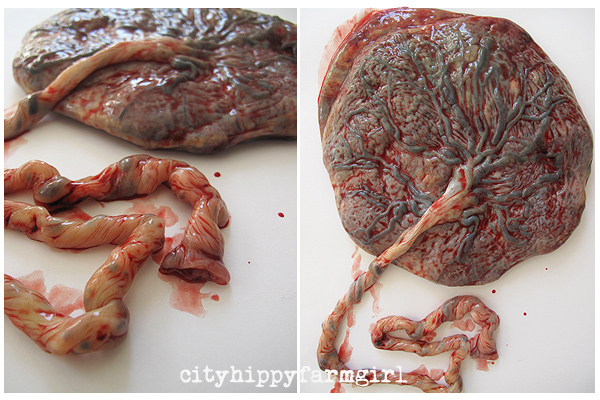 I love that your placenta photo looks like it has an actual tree print on it. They really are amazing arn’t they? My placenta too was whisked off to the hospital lab, thought they did tell me something interesting after investigation: my placenta has a little second placenta growing on the side! My daughter could’ve been a twin, or maybe my placenta had duped itself lol who knows…. I can’t believe it only took a month to break down! Could have been less Sunitra, it’s just that i checked after a month had gone by. Amazing huh. This is amazing Brydie, great photos and it makes perfect sense when you think about it. Your cumquat looks so healthy. I did take a quick peek at each placenta when my two babies were born but I barley remember in among all the other things that were happening at that incredible time immediately after giving birth. Your placenta photos are fascinating. That’s lovely. 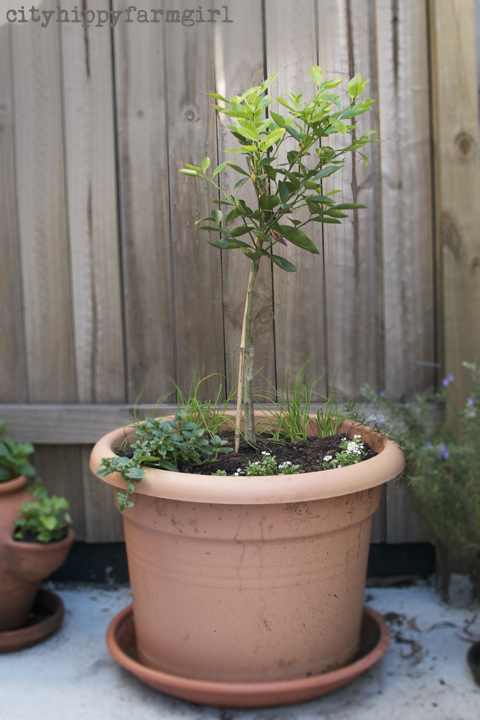 We planted ours under the big lemon tree in the chook’s section of the backyard (ie. fenced off from the doggie section!) We’re in a rental too, and i would so like to have had our homebirth in our own house, and planted the placenta in our own garden, but we’re happy with what we did – we’re good friends with our landlords so will hopefully have a link to this house when we move out. such beautiful detail in them isn’t there. Hi Yammu. Yay, that’s exciting for your weekend! The size of my pot is about 50cm by 50cm. If you have any trouble, citrus/fortunella don’t like anything growing near their shallow feeder roots. The nutrients are probably excellent albeit a little high in iron / sodium but that shouldn’t worry a cumquat much.